Cary, NC, March 31, 2016 – With the biggest nonwovens event this year just a month away, INDA is gearing up for the largest-ever IDEA – The World’s Preeminent Event for Nonwovens & Engineered Fabrics in its 45-year history. The event organizers expect more than 7,000 attendees to attend IDEA16, May 2-5, at the Boston Convention & Exhibition Center. More than 520 exhibitors from 70-plus countries have already booked space, surpassing the 480-plus three years ago. 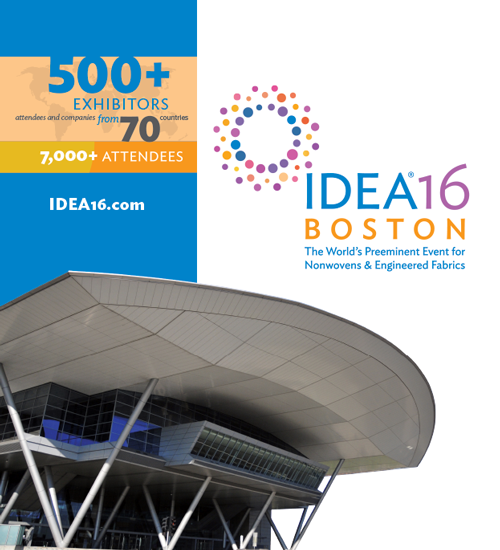 Registration is still open at www.inda.org/idea16. IDEA16 will feature live morning market intelligence reports from leading research analysts on game-changing trends in Greater Europe, China and the Asia Pacific, North America, South America, and the Middle East before the exhibition hall opens, May 3-5. Companies exhibiting represent the entire value chain with many planning to unveil new offerings at the event. For more, see INDA’s Member News section on the INDA website. Other highlights include the presentation of the IDEA16 Achievement Awards recognizing the brightest innovations across the industry. Velcro Companies is the sponsor for the Welcome Reception on May 2 at the House of Blues. Other sponsors include: Dow Chemical Company (Gold sponsor), Bostik Inc. (Silver Sponsor), and Web Industries Inc. and Xerium Technologies Inc. (Bronze Sponsors).